A bullied girl is befriended by another girl. Ayumi and Sayako are roommates. Ayumi is dating Asami. Sayako is dating Keiko. What happens when Ayumi and Sayako both find out the other is dating another woman? 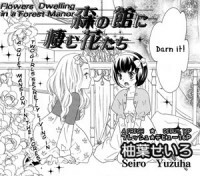 From Lililicious: "Flowers Dwelling in a Forest Manor," by Yuzuha Seiro, is about two girls who are in the process of being converted to vampires. The 11th oneshot in Yuri Tengoku Anthology. [From from Lililicious]: "Friends" is the story of two particular girls who become friends, one of whom just happens to be the Board Chairman of their school. From Lililicious: "Footprints in the Snow," by Takahashi Mako, is about fate.